Chris Greenfield stands in front of a road she says never should have been built on her family's property. By the time Kootenai County ordered work to stop on a road being plowed through rural property owned by the Greenfield family, the damage was already done. A gravel road had been pushed through the family's property on Lake Coeur d'Alene off Hull Loop Road. The new road crosses the length of their land to connect with a neighboring parcel, owned by family relatives, and building it required the removal of dozens of trees that were cut down and sold for timber without permission. The worst thing, the family says, is they never signed off on a road there. "We had all of our property rights trampled," says Chris Greenfield, who serves as a spokeswoman for the Greenfield Family Trust, which owns the land and is operated by her ex-husband, Dwight Greenfield, and his brother Monroe. After work started on the project in August 2016, the Greenfields appealed to Kootenai County to stop the construction, trying to provide documentation that showed the plans submitted by the project's lead firm, Verdis, were not correct. They sent letters to subcontractors telling them they were trespassing and even called the Sheriff's Office after their gate was removed to make way for a bulldozer, Greenfield says, but work was allowed to continue under the county permit. The Greenfields say they were not consulted before that permit was issued on their land, and the road was never supposed to go where it was built. Verdis, a land development firm owned by former Kootenai County planner Sandy Young, submitted plans to the county based on an easement that Chris Greenfield says Dwight and Monroe never signed. Young, for her part, declined to comment for this story. Ultimately, the county did stop work seven months into the project after the road was mostly finished. That's because at least a few portions of the road didn't follow the borders outlined in the disputed document submitted by Verdis. 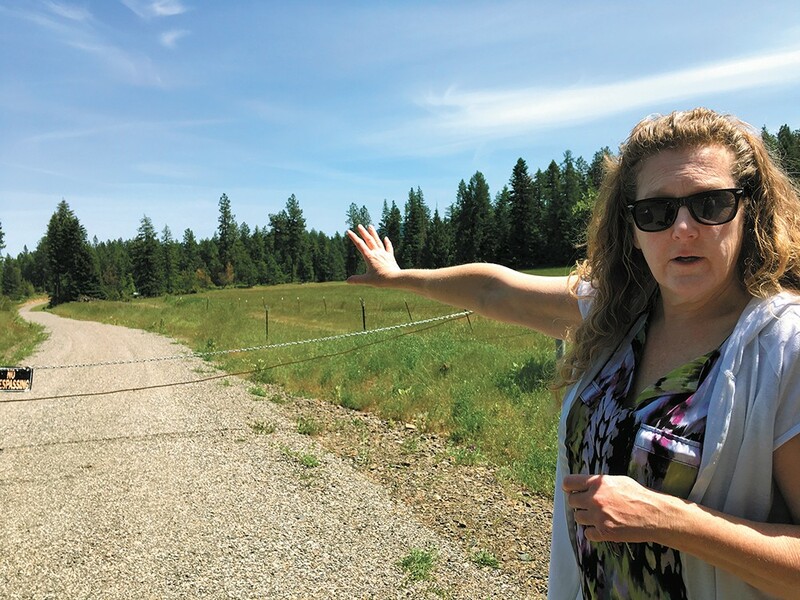 Now, two years after the Greenfields started fighting the project, Kootenai County is considering approving another permit for Verdis to fix those portions of the road the county agrees were built outside of the boundaries. But the Greenfield family still claims the road shouldn't have been built at all, and they question whether there was lax county oversight on a project spearheaded by a former county planner. "The county ignored me saying, 'This is in the wrong place,' repeatedly," Chris Greenfield told the Kootenai County commissioners during a board meeting on March 21, 2017, the same day a stop work order was issued for the project. "I'm tired of everybody saying go get an attorney, litigate this. We're dirt farmers, we don't have $100,000 sitting there. ... We wanted the county to do the right thing: Shut down the project." Years back, the Greenfield Family Trust traded that neighboring parcel to their cousins, the Thurns, and granted an easement for a paved road to go through the north side of the Greenfield property so the cousins could drive out to their land, Chris Greenfield says. But this gravel road was built on the complete opposite side of the Greenfield property, going over an old driveway that'd been shared with neighbors for years. Greenfield says Dwight and Monroe never agreed to that plan, which Verdis owner Young submitted. While they've asked several times to see the original copy of the easement with their signatures, Young has not provided it, Greenfield says. "Our attorney has never seen that paper," she says of the attorney the family used when the land was being swapped years ago. "He's never had a copy." But questioning the validity of that document isn't something the county can do, explains Kootenai County Community Development Director David Callahan. They would need to hear that from a judge. The county planning department reviews plans for thousands of projects a year, for everything from houses to roads like this one, but they're looking to make sure the engineering plans are sound for runoff and slope stabilization, ensuring that vegetation will be properly in place and the site will be handled right. They're not questioning the truth of documents that have been recorded, Callahan says. "Ms. Greenfield hasn't accepted that we think that the easement in the south is a proper one. She thinks it's there by fraud," Callahan says. "Any allegations the easement is improper is between the Greenfields and the Thurns." The Thurns did not return calls asking whether they would like to comment. However, Callahan admits the county did err in approving the plans as submitted, as the road deviated in some places from the boundaries it should have followed under the agreement. "We approved the permit for this driveway construction based on the engineering we'd received, and the [Verdis] engineers got it wrong in that they put it outside of the known easement," Callahan says. "My attorneys tell me that we're not negligent in that way, because that's the responsibility of the engineer. But I felt bad about it once I understood what was going on." Greenfield wonders if the plans weren't scrutinized as much because Young used to work as a county planner. "We think she kind of gets a little bit of a pass there," Greenfield told the commissioners last year. "We're kind of wondering if some of this slid in because it may be who she knew." "It's just wrong to say we're good buddies; if anything, the reverse is true, first of all," Callahan said at the same meeting. "Secondly, because of this sort of problem since I've been here, which is almost three-and-a-half years, the staff looks more diligently at anything that Sandy brings in than they do others, because these projects are almost always problematic." When asked by the Inlander recently what other projects had been problematic, Callahan couched his comments from last year. "Sandy's firm tends to take on more challenging projects that require staff to do greater scrutiny to make sure we understand all the challenges," Callahan says. Young declined to answer questions from the Inlander, including whether she wished to dispute the Greenfields' claims that she improperly filed the easement, or comment on the idea she gets any special treatment from the county. "I have no comments at this time," Young wrote by email. Jeff Wood of Alamo Excavating also declined to comment for this article. Without gaining ground with the county, at this point, the family's only option, it seems, will be to try to find a lawyer willing to go after all the parties for damage to the property, Greenfield says. The original print version of this article was headlined "'Rights Trampled'"